Also, the document cites significant costs attached to that infrastructure--more than $80 million for the first three towers, and more than $190 million total, plus at least $50 million more for Long Island Rail Road costs. The source to fund all that is unclear. The first three towers (B5, B6, B7) would be over Block 1120, between Sixth and Carlton avenues, and the fourth would be the first of three over Block 1121, between Carlton and Vanderbilt avenues. The railyard is between Pacific Street and Atlantic Avenue. Not only is there a history of delays with this project, building towers over the railyard requires costly, time-consuming infrastructure, notably a platform. 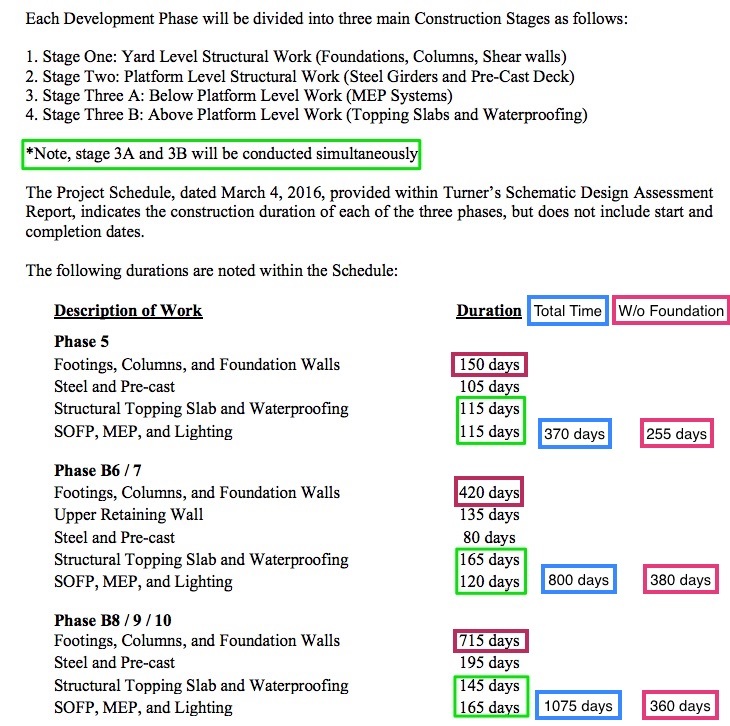 The document is from a project construction monitor, JLL, which cites a project schedule, dated 3/4/16, describing the potential duration of various infrastructure phases, all of which would precede vertical construction. 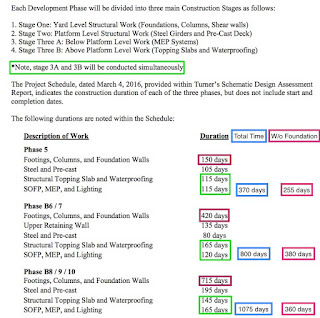 The document also cites a "Project Construction Schedule," which surely exists, but has not been made public (though the appraisal document did offer partial information). Elapsed time for infrastructure: six years and $192+ million? Foundation, by Norman Oder. Click to enlarge. The bottom line: not counting preliminary work--of which an unspecified portion has been completed--the pre-construction infrastructure could take a total of six years. If all the preliminary work were completed ahead of time--and it won't be--the infrastructure could take a total of three years. That doesn't necessarily keep the first three buildings from being completed by 2025, since they could still meet that deadline even if they don't start in 2021 or 2022. But it raises more doubt about starting the fourth building in 2023. Moreover, as described below, the three phases of work, as of 2016, were to cost a total of $177.5 million. That estimate, increased by 10% for inflation, would be $192.25 million, plus additional Long Island Rail Road costs. The platform shall typically consist of waterproofing and reinforced concrete topping slabs supported on precast planks or tees spanning to steel girders supported on reinforced cast-in-place concrete columns. The platform shall be supported on a combination of caissons and spread footings. Foundations are in the process of being installed at the south end of the site as part of the current rail yard work that is being completed. Modifications and additions to existing yard level services will be made by enclosing the yard. These include: new fan plants and associated ductwork, fire protection, lighting, security, communication, and egress systems. In other words, some preliminary work has been completed--but surely not all. I've annotated the excerpt above right for clarity, adding two columns of text, with colored borders referring to like activity. Note that the schedule referenced is three years old; presumably, an updated version would take account of the partial preparatory work that's been done. The document suggests three phases of work for railyard buildings, assigned to various numbers of buildings: one (B5), two (B6 & B7), and three (B8, B9, & B10), respectively. Each phase, or cycle of work, itself contains four components, two of which are completed simultaneously. Those last two elements are pursued simultaneously. But the key component is the first one, which could last nearly two years for the eastern block of the railyard. Only part of the foundations are currently being installed. Let's look at each of the three phases. To build B5, just across Sixth Avenue from the arena, it would take 150 days to put in the footings/foundation components, 105 days for platform level structure work, and then 115 days for the various tasks in the third and fourth components. The worst-case scenario, assuming all work needs to be done, is 370 days, or more than a year. Were the first component already complete, it would only take 255 days. As far as I know, only part of that first component has been completed. "The pre-placement of foundations is finished," Greenland USA's Scott Solish said at a public meeting this past January. What exactly that means remains unclear. 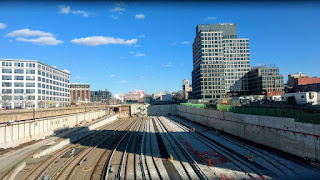 Some 24" caisson piles have been installed in the railyard, according to past Construction Updates, but it's not clear if the 95 required were installed or, even if so, how much of a foundation precursor that represents. If B5 is scheduled to start in 2021, and overall pre-construction work takes a year, we'd have to see work in the railyard starting next year. Building B6 and B7 would take longer, with 420 days of initial work. That sets up a situation in which the preparatory work takes a total of 800 days--or just 380 days if the first component is fully completed ahead of time. If B6 and B7 were to start in 2022, with at least more than a year of initial work, we'd have to see work in the railyard starting in 2021, if not earlier. Block 1121 needs $100+ million of infrastructure; 6 years? In the eastern block, buildings B8, B9, and B10 would need nearly two years of footings and foundation work, plus nearly a year of work on the other components. With that heavy a lift, it seems questionable that B8 could, in fact, start by 2023. In fact, it's a bit curious that B8 was separated out, in the appraisal document, from its neighbors on the eastern block. From a construction standpoint, all are part of the same project. Perhaps it's because B9 and B10 were not part of the collateral for those investors, and thus weren't part of the appraisal. In our opinion, the projected construction term seems achievable for a project of this type and scope provided that there are no hold-ups due to any unforeseeable circumstances, such as strikes, severe weather, and material shortages. But the fact that something is constructible--remember the ten-year term for Atlantic Yards?--does not necessarily mean that it's likely. Either way, the monitor's letter says that they had "requested an updated Project Schedule reflecting the projected start and completion dates of each phase." That's an argument for more sunlight on the process. Note that monitor JLL, formerly Jones Lang LaSalle, is the parent of Merritt & Harris, the subsidiary that conducts the monitoring. JLL acquired Merritt & Harris in 2016. The latter company performed the construction monitoring for the Barclays Center and, in my assessment, was not always eagle-eyed and even sometimes moved the goalposts for the timetable, thus fudging the schedule. None of this counts the time for vertical construction, which presumably would require at least two years for the first building, and surely longer for the phases including two and three buildings, given the complexity of construction and the logic of staggered openings in order to not flood the market with apartments. So the question then is: would vertical construction for one building occur simultaneously with pre-construction work on others? If so, it's plausible that work transforming the Vanderbilt Yard into a residential district could move at a steady pace. But even if it's constructible, that may not be wise in terms of marketing the units. 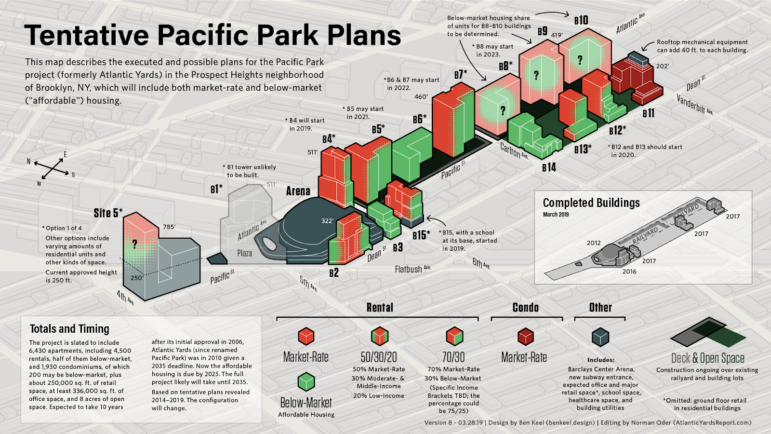 So, if things go slowly, well, completion of Atlantic Yards/Pacific Park could take far longer, perhaps until the 2035 date predicted on a disclosure to condominium buyers. It's another question the building-by-building timetable, requested by some members of the Atlantic Yards Community Development Corporation (and community members), might have answered. 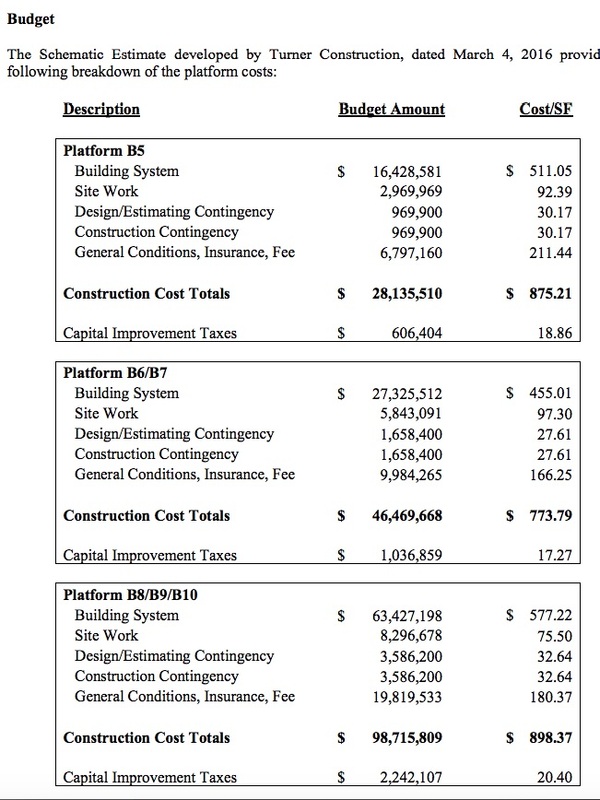 According to the screenshot at right, as of 2016, the platform for B5 was to cost nearly $29 million, while the platform for adjacent B6 and B7 would cost $47.5 million, inclusive of taxes. 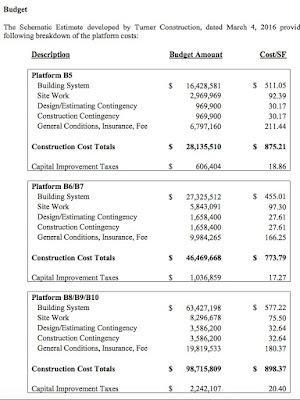 The larger platform, for the eastern block (B8/B9/B10), would cost nearly $101 million. Not counting taxes, the estimated cost of the 202,087 square foot platform, is $173,320,987 or $858 per square foot, according to the construction monitor, who deemed the figure reasonable for the time. However, the current cost was deemed unclear, pending further discussion; given inflation, the figure would "clearly be higher (10%+/-)." So the figure should be increased. With taxes included, the $177.5 million estimate, increased by 10%, would be $192.25 million. It's unclear how that all would be financed and, thus, the likelihood of the process moving forward steadily. Also note that that the cost estimate does not include an additional $50+ million set of payments to assist with Long Island Rail Road operations, a figure that may have increased over time.